On Tuesday 25 July, Mercury moves into Virgo and stays here until 31 August. Mercury is the planetary ruler of Virgo so it’s a happy homecoming of sorts. Mercury in Virgo is conscientious, detailed and analytical. It’s a great time for fine-tuning plans; with Mars in Leo until 5 September, the energies of the weeks ahead are lookin’ mighty productive (eclipses aside, but it’s all good, and anyway that’s next week’s post). On Thursday 27 July, the Sun meets up with Mars along the same degree in Leo. Exciting times! Use this fiery energy wisely and you’ll find yourself knocking back that to-do list like nobody’s business. Mars can a little tricky and in Leo, tempers flare up a little quicker + cockiness abounds. Keep out of stupid fights and do your thing, darlings – if your thing also includes some bragging about how you nabbed a huge client last week with your smarts, hard work and infectious charm, yeah why not! LEFT: FOUR OF SWORDS. Take a time-out. When this card appears, you might be feeling swamped by the process of working through a complex situation that’s taking up a lot of your energy. You’re also advised not to rush into making hasty decisions – sleep on it (some amongst us might need to take this advice literally), and get back to the fray when you’re ready. Adjust deadlines if you must, but don’t skimp on the quality of your decision-making. MIDDLE: TWO OF PENTACLES REVERSED. Balance is key! When this card appears ill-dignified (i.e. upside-down), you’re investing too much time + energy on an issue whilst other priorities suffer neglect. 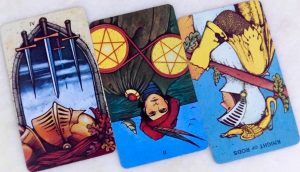 Combined with the Four of Swords, your health and happiness could be at stake if you keep this up for too long. Time to get back to who + what really matter in your life. Combined with the reversed Knight of Rods, take extra care if you’re travelling this week. RIGHT: KNIGHT OF RODS REVERSED. Hold back, soldier! When the Knight of Rods comes swinging at us upside-down, his message is not to start projects you can’t finish, and most certainly not to start fights… This Knight can be childish, temperamental, and flaky as hell. Mindfulness and restraint will go a long way; do not allow yourself to be carried away by the trappings of superficial passion or ego. This week will be productive, but it’s best not to rush. Then again, when is it ever?